← To blow dry or not to blow dry. Since I was a kid, I’ve always been taught to use both sides of the paper. I print on both sides, write grocery lists on the unused side, and since I got married, I’ve started reusing cards. Anytime we get a holiday, birthday or anniversary card, I cut out what I can from them to make my own cards, and use the back side for my grocery list. It’s been my goal not to buy any more cards. If I want to send one, I have to make it. 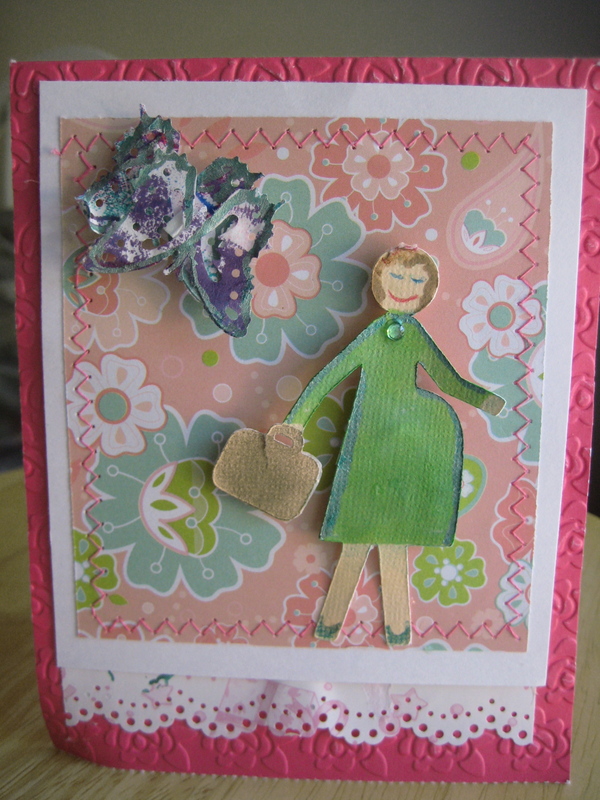 I have plenty of scraps cut out of former cards and magazines, along with construction paper. I simply have to get up and do it! 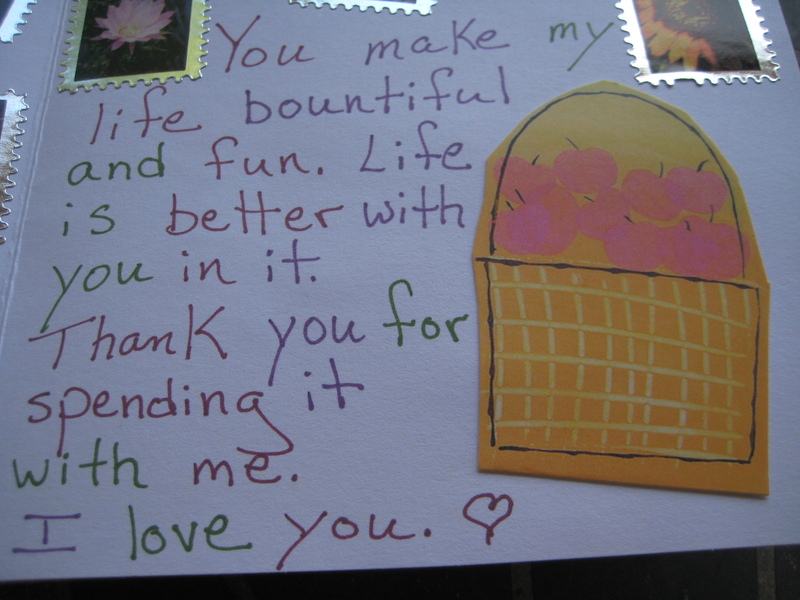 I realize not everyone is crafty, but a homemade Valentine or birthday card goes a long way. And it isn’t too much trouble to glue sentences together of words you’ve cut out of a magazine to a pretty shade of construction paper. People love it. 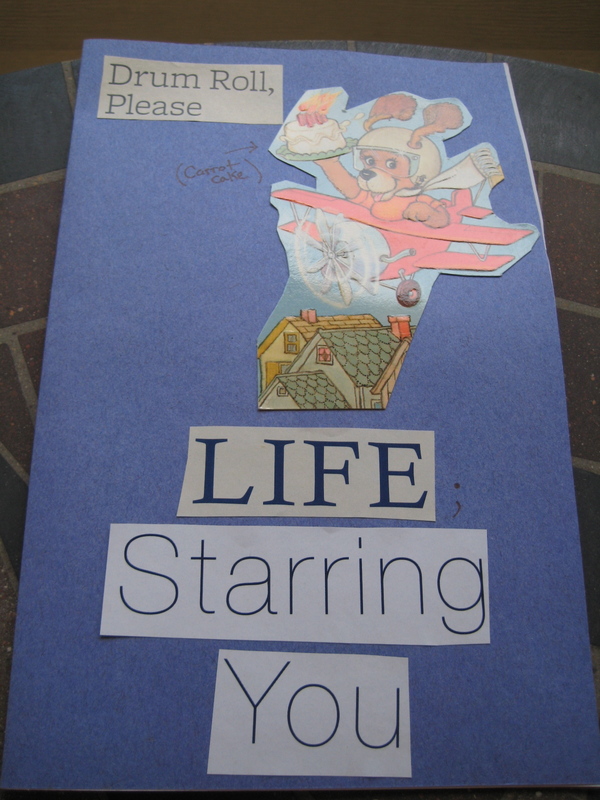 A birthday card made from my husband’s childhood birthday cards. 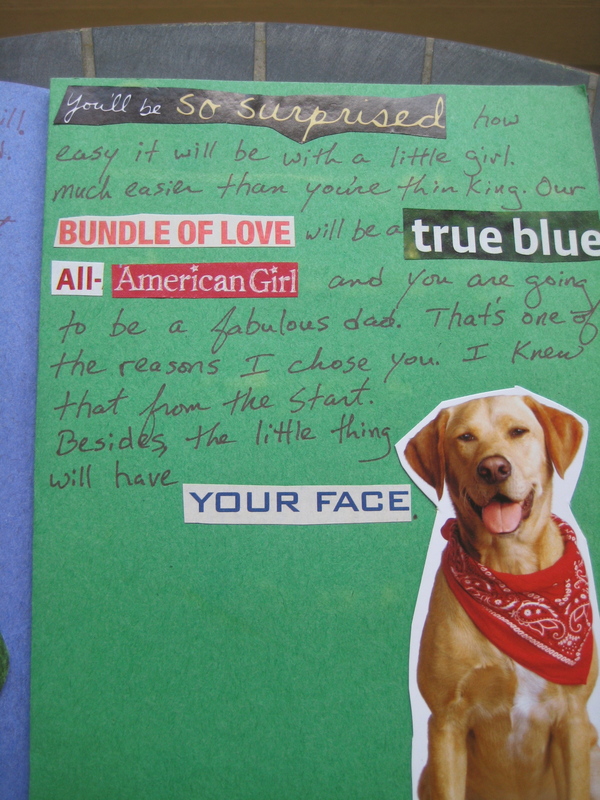 The card I made him while he was out at sea and I was pregnant. If I don’t have time to make a card, a phone call will suffice. People just want to be thought of, right? One of the favorite cards I ever received was handmade by a boy from Connecticut during Air Force Basic Training in 1998. The girls weren’t of course allowed to have much contact with the boys in Basic Training, but we did occasionally get to talk when we were in the same room together. This boy was so ugly with his square, brown military issue BCG’s (birth-control-glasses), and shorn hair, but he had the coolest accent I’d ever heard. He discovered it was my birthday and made me a card with the only materials available during Basic—a highlighter, a piece of loose leaf paper and a pen. He drew a cake on the front and wrote me a terrible poem that rhymed on the inside. I thought he was wonderful. I still have the card! Why can’t I remember his name? I can still see his face…we called him Connecticut. And then there are Peggy’s homemade cards. If you get one, you’d better know you’re special. 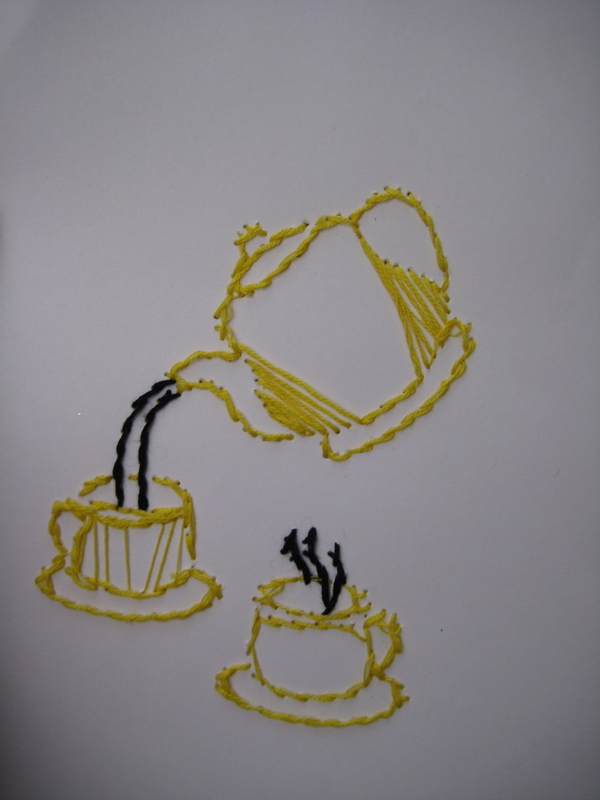 She spends days making them. It’s one of her favorite hobbies. Made for me when I was pregnant. At first I thought the woman just had a large bottom. Then I realized that was her stomach. I think I might have still been in denial that my tummy would ever look like that…..ah, but it did, eventually. As I get busier and older (to the point where I just don’t care), I may start resending the cards and only take the time to cross out the name. Ha! 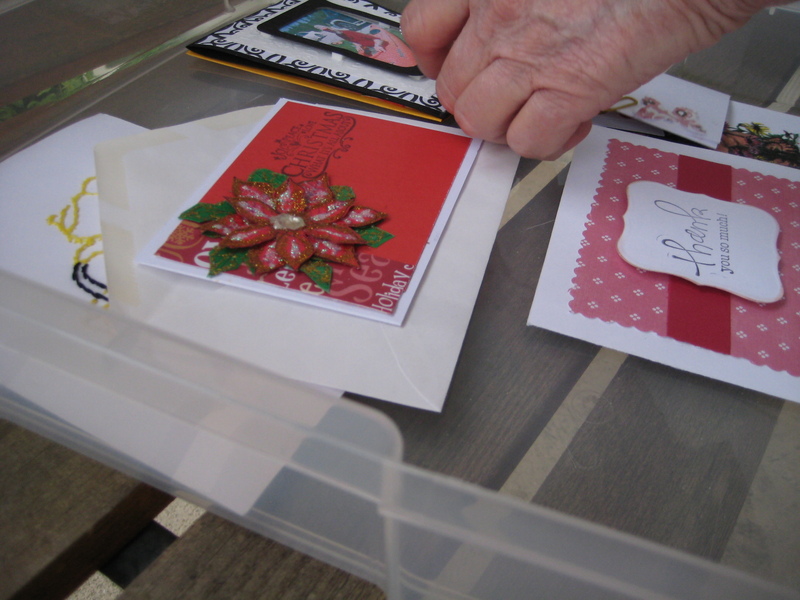 Do you have any stories of homemade cards you’ve made or received? 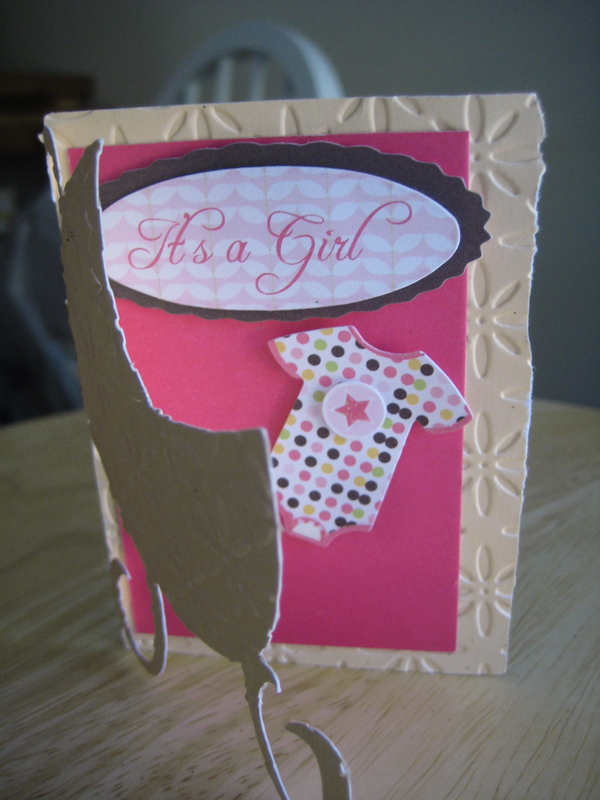 This entry was posted in Reusing and tagged crafts, Greeting card, homemade cards, military spouse, militaryzerowaste, miltary lifestyle, zero waste. Bookmark the permalink. My grandparents gave each other the same card each year on their anniversary – they just added the new date each year and set it beside the other’s breakfast each year. I also stole a trick from a friend of mine – I keep any Christmas cards that we are sent each year and and them as gift tags the next year by cutting circles out of them and writing on the backs. It works great. It would mean more every year! I don’t reuse cards – but like you I do keep a reasonable amount of them. 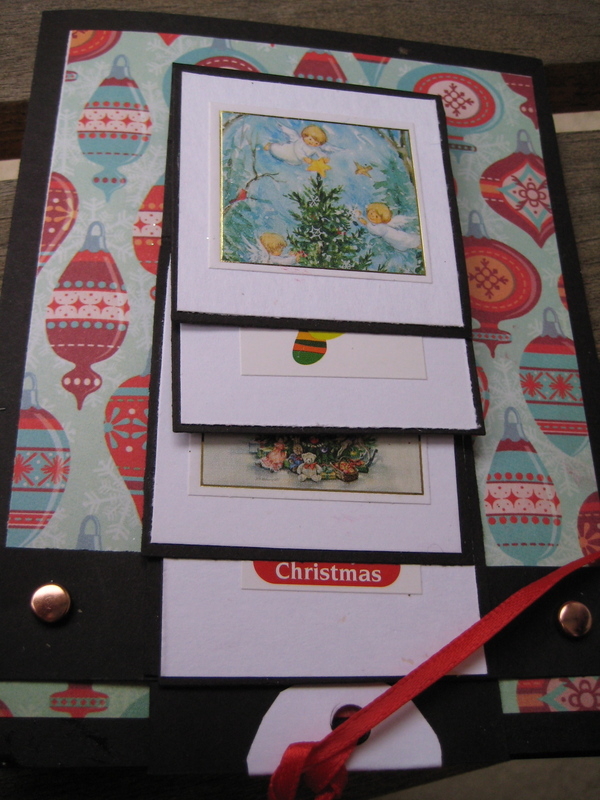 I do, however, ask for gifts at birthday/christmas for blank (inside) cards with a nice generic front. I have used a version of these three types of cards for more than 18 months, with no complaints from friends – weirdly I can recall which card they got ‘last time’ and so cycle to the next type! There’s a silver/grey with a pattern in white (good for men), a woman with a gift (better for girls, but for guys I say ‘that’s me on the front!’) and then some small yellow and pink cards, with multi coloured polka dots. They work well as a ‘gift-tag’ essentially. I’ve thought about doing this but have yet to do so. I do save most every card that I receive with this idea in mind. 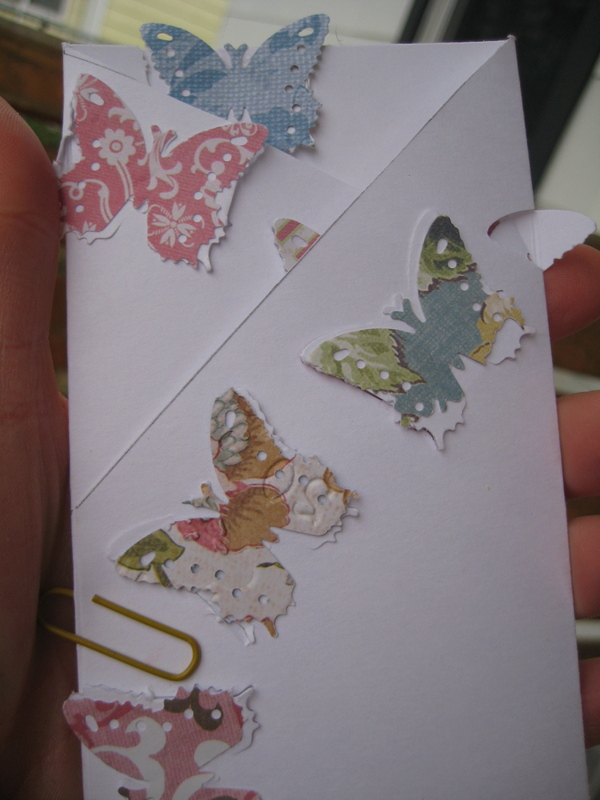 Actually I rarely send cards so making them hasn’t been a priority. I should start sending more cards since the postal service could use the business and cards make people kind of happy.